As it turns out, stairs are something that can't open and close. Thanks, Heather. 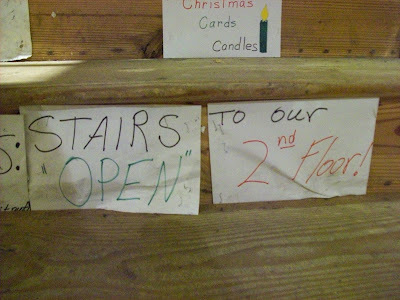 Maybe it's supposed to be read across: STAIRS to our "open" 2nd floor. The place could be really jam-packed with merchandise so that you can hardly walk, hence the use of quotes to describe it as 'open'.